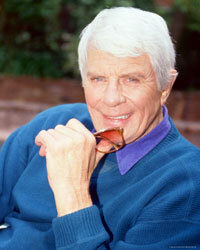 Peter Graves, who starred in TV's Mission Impossible, and later spoofed his persona in the Airplane comedies, died in Los Angeles on Sunday. He was 83. Graves died of an apparent heart attack outside his Los Angeles home, publicist Sandy Brokaw told the Associated Press. He had just returned from having brunch with his family when he collapsed, Brokaw said. Although one of his daughters administered CPR, she was not able to revive him, according to a report in People Magazine. Born Peter Aurness in Minneapolis, the blond, 6-foot-2 Mr. Graves served in the Army Air Forces in 1944 and ’45, studied drama at the University of Minnesota under the G.I. Bill of Rights and played the clarinet in local bands before following his older brother, James Arness, to Hollywood. His first credited film appearance was in "Rogue River" (1950), with Rory Calhoun. Mr. Graves’s getting a Hollywood contract for the picture persuaded his fiancée’s family to let her marry him. He changed his name for that movie to Graves, his maternal grandfather’s name, to avoid confusion with his older brother, New York Times reports. Graves won a Golden Globe Award in 1971 for his performance in Mission Impossible, and in 1997, he and Biography won an Emmy Award for outstanding informational series. Besides his brother, he is survived by his wife, Joan Graves, and three daughters, Amanda Lee Graves, Claudia King Graves and Kelly Jean Graves, according to TheCelebrityCafe.com.